Since the beginning of the 20th century, Korea had been a part of the Japanese empire, and after World War II it fell to the Americans and the Soviets to decide what should be done with their enemy’s imperial possessions. In August 1945, two young aides at the State Department divided the Korean peninsula in half along the 38th parallel. The Russians occupied the area north of the line and the United States occupied the area to its south. By the end of the decade two new States had formed on the peninsula divided by geography and ideology, and with a powerful distrust of one other. In the south, the anti-communist dictator Syngman Rhee enjoyed the reluctant support of the American government; in the north, the communist dictator Kim Il Sung enjoyed the slightly more enthusiastic support of the Soviets. Neither dictator was content to remain on his side of the 38th parallel, however, and border skirmishes were common. Nearly 10,000 North and South Korean soldiers were killed in battle before the war even began. Two days after the invasion the UN Security Council authorized the formation and dispatch of UN forces to Korea, to repel communist aggression. Twenty-one countries contributed to the force, with the United States providing nearly 90% of the military personnel. Initially the North prevailed. The north Korean troops were well prepared and well equipped – unlike Syngman Rhee’s forces who were neither. Furthermore, the allied forces were of the view that this was a defensive war: that is, simply to repel the communists from south of the 38th Parallel. The lack of an aggressive strategy and failure to deploy sufficient troops resulted in South Korean and US forces being forced back to a small area, where they were poised on the brink of defeat. By September 1950, however, a new set of war aims had been established. It was recognised that this was no longer a defensive war but an offensive one, with the sole aim of liberating the North from the communists. An amphibious UN counter-offensive was launched that cut off many North Korean troops. UN forces then consolidated this initiative, crossed the 38th Parallel and headed north towards the Yalu River which was the border between North Korea and Communist China. This in turn triggered Chinese concern about the ‘armed aggression against Chinese territory’. Mao Zedong, the communist leader, warned the United States to remain clear of the Yalu boundary unless it wanted a full-scale war. He also deployed mass Chinese forces into north Korea, forcing a retreat. Chairman Mao’s ultimatum caused a rift between President Truman and General MacArthur, the C-I-C of the Asian Theatre. Truman believed that uncontained hostilities with China could rapidly involve Soviet aggression in Europe with the risk of atomic war. MacArthur was unbending, however, believing that anything short of this conflict represented an unacceptable compromise to communism. The rift widened when MacArthur wrote to a house Republican leader who could be counted upon to leak the letter to the press. ‘There is,’ MacArthur wrote, ‘no substitute to victory.’ The letter was the last straw for Truman, who fired the general for insubordination in April 1951. The deployment of hundreds of thousands of troops on both sides resulted in a ground war stalemate, but the air war was constantly active. North Korea was subjected to a massive bombing campaign and fighter aircraft fought each other above its skies. Peace negotiations had begun but they were protracted, and fighting continued. A major stumbling block was the prisoner of war repatriation, as many Chinese and North Korean prisoners refused to be repatriated back to the North. This was unacceptable to their respective governments, so the negotiations frequently stalled. It took more than two years for a cease fire to be effected. The armistice was signed on 27 July 1953, which allowed POWs to stay where they liked, drew up a new boundary near the 30th Parallel (that gave South Korea an extra 1,500 square miles of territory), and established a two-mile-wide demilitarized zone between the two countries, which exists to this day. Nearly five million people died in the short but bloody conflict, almost half of which were Korean civilians. Almost 40,000 Americans lost their lives and more than 100,000 were wounded. Australia lost 340 dead, the great majority of which were troops on the ground. There was no formal peace treaty and technically, the North and South are still at war. The Korean War, which ended nearly 65 years ago never resonated with the public in the way that World War II did, although it cost the lives of over 37,000 American soldiers alone. Perhaps it was because it was on a different scale to the struggle that had engulfed the world only a few years earlier, or because it wasn’t a ‘declared’ war and ended in a stalemate. Whatever the reason, it earned the name ‘The Forgotten War’ in the 50s, and has been known as such ever since. But for those who served there, Korea was a deadly conflict against a well-armed and disciplined enemy. Marcus Peake looks at the story behind the history. On 11 May 1950, the Australian Prime Minster, Robert Menzies, announced that the aircraft carrier HMAS SYDNEY (III) (Captain David Harries) would relieve the Royal Navy’s HMS GLORY for a period of about three months from October 1951. By then the war on the ground had reached a stalemate, with both sides gridlocked roughly around the 38th Parallel. The carrier was given about three months to work up the Air Group and arrive in theatre. To prepare for the Korean deployment 805 and 808 Squadrons embarked on SYDNEY on Sunday 15th July 1951 (817 Squadron was to follow on 24/25 August). Records indicate that the elements of the 20th/21st Carrier Air Group (CAG) would be called ‘The Sydney Carrier Air Group’, and remarked that it would be difficult to differentiate between 805 and 808 Squadrons, as maintenance would be pooled and pilots would fly whatever aircraft was spotted, irrespective of their parent Unit. By contrast 817 Squadron with its 12 Fireflies easily retained its own identity. ‘I was the Gunnery Officer of HMAS ANZAC, the brand new destroyer that acted as plane guard for SYDNEY during some of the work up. SYDNEY had ten major crashes (within our view) in ten days as she worked up in heavy weather off Jervis Bay. Flying eventually ceased when a [new Pilot’s] Sea Fury bounced – and went over the side where the barrel of a Bofors pinned the aircraft like a moth! The pilot went up the wing like a rat up a drainpipe and so onto the flight deck. An OA was trapped under the breech of the Bofors but escaped unharmed. The plane could neither be pushed overboard nor hoisted on the crane – so back to Jervis Bay’. (Photo: LEUT Knappstein). 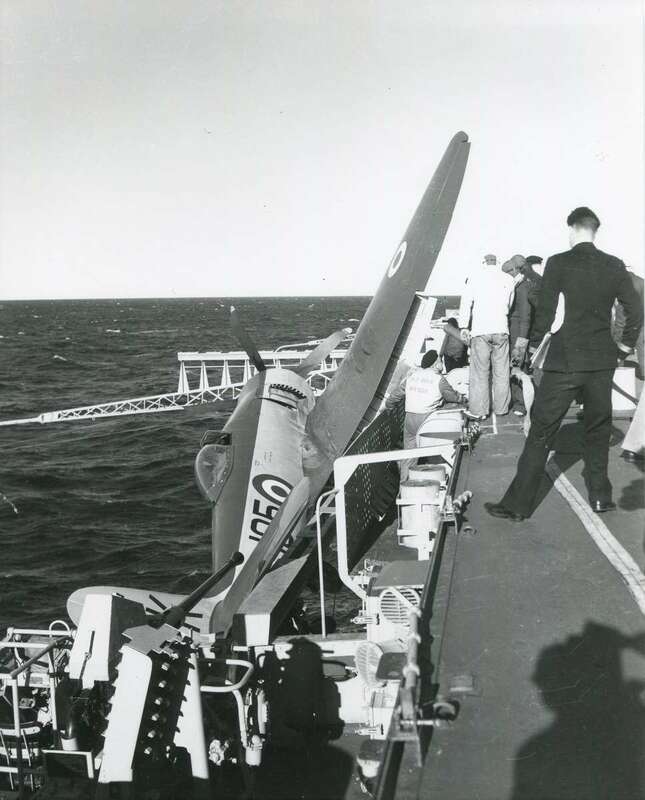 Similar accidents occurred on 24th July with another Barrier arrest (Sea Fury VX763), and on 25th July when two other Sea Furies (VX755 & VX725) struck the Barrier after bouncing over arrester wires. All-in-all it was not an auspicious start, although to be fair there is clear evidence that the weather conditions were far from ideal for inexperienced pilots. After taking on fuel and supplies from Garden Island, SYDNEY headed north towards Hervey Bay to find more favourable flying weather. For the Firefly crews, effort was primarily expended on dive-bombing techniques. Early results had demonstrated more practice was necessary, including a precise angle of 55 ± 3° during the attack: Live bombing occurred on ranges in the area and the ship was kept well supplied with stunned fish harvested after each run. The opportunity for strafing practice was also taken, as was an Army cooperation exercise. In the meantime, the Sea Furies conducted rocket and strafing strikes on Bird Island and Morna Point Ranges, and later on Fairfax Island Range. All aircraft were now working ‘the Korean system’ – that is, free take-offs were ceased in favour of catapult launches, a constant Combat Air Patrol (CAP) was provided and, for the Fireflies, Anti Submarine Patrols (ASPs). This essentially meant aircraft were in the air from 0800 to 1600, with each crew receiving six or seven sorties per week. SYDNEY returned to Sydney on 18th August and most aircrew were detached to Nowra for leave. One can only imagine the misgivings of wives and loved ones at this time: most of the experienced aircrew had survived WW2, and now, only six years later, they were about to join another conflict. Australia had already committed ships and ground forces to the affray and the news was full of reports of the fighting and the hardships being endured. It would have been a bittersweet farewell. With flags flying and a band playing, SYDNEY sailed from its namesake city at 1330 on Friday 31st August 1951 in fine weather. She was in company with HMAS TOBRUK, a Battle Class destroyer under the command of Cdr. Richard Peek RAN, who was to command the SYDNEY much later in her role as a fast troop transport. The CAG embarked not long afterwards, having overflown the ship in a “K” formation prior to breaking off to land aboard. Both ships called in at Manus Island, where a fly-past was conducted at the request of the local Administrator in Rabaul who thought a show of force following civil unrest would be useful. The subsequent report suggested it had been a great success. The accident was significant as it was a common perception that ditching with the landing gear down would flip the aircraft, and in any case the great weight of the Bristol Centaurus engine would immediately drag the fuselage down. In the event Webster found little difficulty, for although the cockpit was under water the aircraft stayed afloat long enough for him to escape. The incident gave confidence to other pilots. After a brief trip to Yokosuka SYDNEY proceeded to Kure (via Yokosuka), where she arrived on September 27th. This would have been a picturesque trip through what is sometimes called the Riviera of Japan, with the ship steaming through the Bungo Suido channel with a lone Sea Fury beating her up. Having braved a myriad of fishing boats in the darkness, she entered Kure Harbour via the swept channel and at 0830 secured next to HMS GLORY, whose marine band played the 1950 hit tune ‘If I’d Known You Were Coming I’d Have Baked a Cake’ as she came alongside. After the normal salutes and dismissal of the hands, people went to the side of the flight deck to see if any old friends or acquaintances could be observed on GLORY’s deck, and half of her officers were invited to lunch in SYDNEY’s wardroom and vice versa. Above Left: The handover with HMS GLORY in Kure over the period 27-30 September 1951. HMAS Sydney is on the left, with Glory just across the jetty. The transfer not only involved the loan of six Firefly Mk V aircraft but ‘several tons’ of documents and briefing material. Above Right: The Sikorsky helicopter from Glory landing on Sydney’s flight deck. (FAAM images – click to enlarge). The handover with GLORY was a busy time as detailed intelligence material was transferred (photographs, maps etc. ), together with some aircraft: primarily Firefly FR.5s to replace 817 Squadron’s AS.6 aircraft. The British Aircraft carrier also transferred a loan USN Sikorsky helicopter and crew, which was to play an important part in subsequent rescues of aircrew. In return SYDNEY’s damaged aircraft were placed on GLORY for return to Australia. Above: HMS Unicorn was an aircraft maintenance carrier that was to play a pivotal role in replacing Sydney’s lost or damaged aircraft. (Wikipedia). Below: A timeline of the Korean conflict throws some perspective on Sydney’s total involvement. Click to enlarge. (Image: Marcus Peake). HMS UNICORN also arrived in Kure (on the 28th September) wearing the flag of Flag Officer, Second-in-Command Far East Station, Rear Admiral A.K. Scott-Moncrieff DSO RN. UNICORN was to play an important part in the coming months as she supplied replacement aircraft to SYDNEY. She had been purpose-built as an aircraft maintenance vessel, but had a full- length flight deck to enable exchange of airworthy aircraft, and to allow strikes if operationally necessary. Underneath it she had two hangar decks – giving her a somewhat foreshortened appearance – which could accommodate up to 48 aircraft with folded wings and a further 8 with wings spread. She also had extensive workshop facilities that allowed up to depot-level maintenance, if necessary. The stern was squared off to allow aircraft engines to be run below decks, and carried an extensive suite of spare parts for both the Sea Fury and the Firefly. Her presence in the region made things much easier than they otherwise might have been. 817 Squadron recorded similar activity, noting that the replacement Mk FR.5 Fireflies were generally found to be in good condition, and observing that the power-folding wings would save a lot of handling time. Sidearms and ammunition were also issued to Firefly crews, together with briefings on operations and escape and evasion. Amongst this feverish activity time was still found for the Commander in Chief Far East Station, Vice Admiral the Honourable Sir Guy Russell RN, to hold Divisions and inspect both ships on Sunday 30th September 1951. He made no bones about the poor state of GLORY, adversely comparing her with the very favourable impression SYDNEY made upon him. The Executive Officer was Cdr. (later Admiral) Victor Smith, himself a Fleet Air Arm officer and known for his efficiency – and for his love of a smart ship. It was a joke amongst the aircrew that the ship was always being painted, and that the diversions thus caused in her passageways made it harder to get to the Squadron briefing rooms than it was to get to the target. This was the start of what was to be a series of congratulatory messages and signals on the appearance, and more importantly, on the performance of SYDNEY and her Air Group over the coming months. Following Divisions SYDNEY’s Wardroom hosted drinks for GLORY’s officers, after which the latter sailed for Australia via Hong Kong. SYDNEY slipped her moorings three days later, at 0830 on Wednesday 3rd October 1951, for its first patrol off the west coast of North Korea. She carried three full Squadrons – the Sea Furies of 805 Squadron (Lt.Cdr. Bowles RAN) and 808 Squadron (Lt.Cdr. Appleby RN), and the Fireflies of 817 Squadron. (Lt.Cdr. Lunberg RN). This number of aircraft caused significant congestion problems as only 20 could be stowed in the hangar. The remainder had to be spotted on the flight deck, causing a great deal of extra work for the handling parties, who had to constantly shuffle aircraft around. Captain David Harries (RHS) visits the Chief Petty Officers’ Mess aboard HMAS Sydney. The President of the Mess is to his right, stood in front of the Executive Officer, Cdr. V.A.T. Smith. Sydney had a reputation as not only being a very smart ship, but also an extremely efficient one. (FAAM image). The ship’s operation was divided into patrols, which she shared with the US light carriers RENDOVA and BODOENG STRAIT. Over the Korean deployment SYDNEY conducted seven such patrols, each with a duration of about 10 days. Typically there was a short break between them during which the ship returned to Japan, some 800 km to the south-east. Whilst on patrol SYDNEY was always at Defence stations, which meant a small number of her guns were manned by sufficient crew to bring weapons to bear should the vessel come under threat. The ship always went to Action Stations pre-dawn and at dusk primarily as a drill but also, for the morning event, to mark the beginning of the working day. Aircraft for the first serial of the day would be prepared before dawn. The first serial was always spotted and armed the night before, but work was still needed: maintenance and aircrew before-flight inspections but also drying out gun barrels, refitting of gun safety plugs and removal of rocket RADHAZ barriers. The first serial was always launched pre-dawn. The principal role of the Air Group was to disrupt the enemy’s supply chain by attacking all means of transport, but other tasks such as close army support, naval gunfire spotting, targeting guerillas, anti-shipping strikes and armed reconnaissance were not infrequent. Aerial photography was mainly undertaken by Sea Furies, using fixed vertical and oblique cameras, and helped in both the selection of targets and for subsequent damage assessment. There was also a daily reconnaissance flight known as the ‘Milk Run’ which consisted of a flight of aircraft flying low along the coast scouring the beaches, inlets and islands for signs of enemy junks, which were the main form of enemy transportation. Close air support missions were popular with the pilots and were welcomed by front line troops. The aircraft carrying out these missions initially called the front-line controller, who in turn handed over to a ‘Mosquito’, which was a small Auster aircraft. The Mosquito would give the pilots the target to attack and, if necessary, could mark it with smoke to indicate the right spot. These small aircraft would spend hours over the front line, often at low level, and unsurprisingly several were shot down. 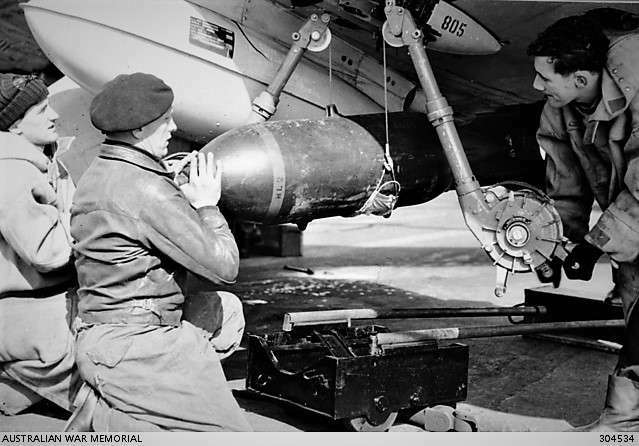 Early in the campaign SYDNEY’s pilots had been told by visiting Americans that in the event of anyone being shot down, the whole air war in Korea would virtually cease so that a full scale RESCAP could be carried out. This was soon to be proven correct, with operational aircraft being diverted to search for missing aircrew and/or providing an overhead umbrella whilst rescue was being effected. This Sea Fury looks as though it was last to land after a Korean War sortie (wings left spread, invasion stripes and the loaned USN helicopter UP28. A flight deck team is gathered around ready to move the aircraft, probably waiting for the respot board to be finished. Or, it could have been brought up from B hangar for an engine run or the next day’s first sortie. The wings were typically left spread until they loaded the 3-inch RPs. The flight deck team are wearing (non-RAN borrowed leather jacket) foul weather clothing. The helicopter might well be planning a landing just aft of the forward lift (there seems to be one yellowshirt facing aft just clear of the deck park) but it is equally likely that UP28 had just taken off from its frequent end-of-day aft spot to transfer mail, etc. with a destroyer on the screen. (Photo: FAAM). This was the day that Sydney broke the record for the most number of sorties (89) for a Light Fleet Carrier. Unsurprisingly, it was an exceptionally busy day with Sea Furies and Fireflies attacking troop bivouacs, tungsten mines and small towns ashore and conducting gunnery spotting for NEW JERSEY, BELFAST and HANSON (Belfast’s Gunnery Officer paid a visit to the Sydney two days later and was highly complementary on the standard of 817 Squadron’s spotting). On 12th October Sydney arrived in SASEBO at 1515, thus ending her first Patrol – but the break was rudely interrupted by Typhoon Ruth which announced its impending arrival by means of heavy rain throughout that day and the next. Fearing cyclonic conditions in limited sea space, SYDNEY flashed up all boilers and left early on the morning of Sunday 14th in company with BELFAST, UNICORN and two Destroyers, rolling heavily as she entered open water. The worst of the storm occurred between 2000 and 2200 that night, when the ships experienced seas of 45 feet (14m) and winds in excess of 68 knots (130km/hr) – although they might have been stronger as the SYDNEY’s anemometers failed. 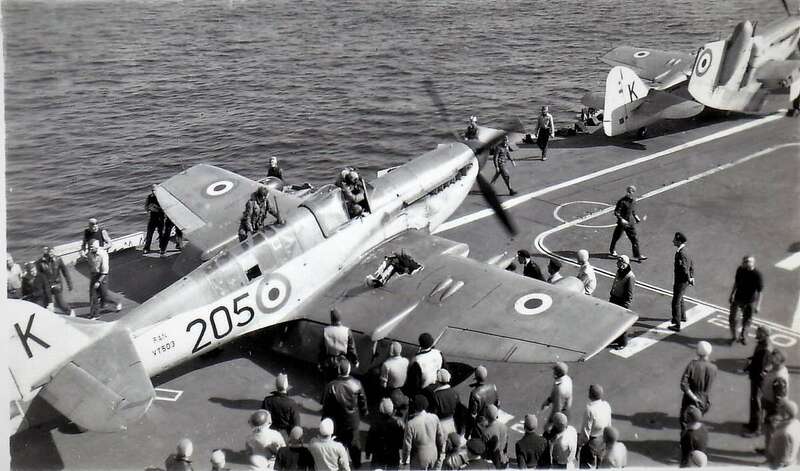 There were 13 aircraft on deck just aft of the island, and aircraft handlers secured by lifelines worked ceaselessly to secure loose lashings before going below in a state of exhaustion. One Firefly was washed overboard and six other aircraft seriously damaged as follows: two Sea Furies (rudder damage), one Sea Fury (write off), one Firefly (washed overboard); two Fireflies (write off) and two Fireflies (major damage). ‘HMAS SYDNEY 14 October 1951 Sasebo Harbour No. 8 Buoy. Sunday morning routine, Divisions and Church interrupted by a pipe over the loud speaker system – ‘due to deteriorating weather conditions the ship will proceed to sea’. Soon afterwards, the SYDNEY and several other ships were clearing the harbour for the Yellow Sea. Another pipe was made for the crew of the Sea Fury to report to the flight deck. Before long, the late L/PM Pat Maloney and myself were attached to life lines securing external control locks on the aircraft and any other tasks, under the supervision of POAF(A) Bill Bailey RN. Early in the afternoon it was a Duty Watch situation. Frank Donnelly and I were part of the A/E part of the Emergency Party and LAAH ‘Ace Kleidon was the Duty L/H, we were on the flight deck with instructions to secure anything that moved. A call came from one of the Handlers ‘Away Skimmer’, as the craft, which was normally cradled outboard of the flight deck crane, suddenly appeared on the crest of a wave off the ship’s side. Early tea in the forward cafeteria and enjoying the break. L/PM Mick Thomas was sitting opposite and his brew slid off the table into his lap. He quickly disappeared and returned shortly afterwards wearing his inflatable life vest. It was then back to the hangars to double lash the aircraft. The ship’s movement was causing amounts of high octane to be vented form the aircraft tanks so they had to be defueled. Then it was back to re-tensioning the bottle jacks on the lashings, the adjustments of which were very primitive. All this activity was constantly being interrupted by Emergency Parties attending reported fires, Bomb Room, Wardroom Galley, Main Switchboard etc. There were some worrying thoughts as you headed to the most recently reported fire. It turns out that there were no major problems, just plenty of water in the ventilation fans. The night was spent in the hangars, fire curtains lowered, any loose gear was soon heard and secured. As the ship’s bow buried into the seas you could hear the water cascading along the flight deck and emptying into the forward lift well. What Did An Armourer Do? For practical purposes the two Fury squadrons operated as a single unit but the two types of aircraft (Furies and Fireflies) operated in separate roles. Furies launched five serials of seven aircraft each day. The Fury serials were made up of five ground attack aircraft, armed with four 20mm Hispano guns each with 125 rounds, and 8 x 3 inch rockets fitted with 60pound HE semi armour piercing heads; and two combat air Patrol (CAP) armed with guns only. 500 or 1000lb HE GP bombs and on rare occasions 16 x 3 inch rockets. Gun Servicing and Cleaning Party. These fellows were the real troglodytes of the branch. They were poked down in a dim airless workshop at the back end of C Hangar and stayed there until the end of the deployment. 20mm Hispanos had to be stripped and serviced after firing only 500 rounds and as this number was reached after 4 serials it was an all day, every day task. Gun Change Party. This team did nothing but change guns mounted in aircraft. This was usually done between serials because of the rapid accumulation of rounds fired and the need to turn aircraft around. Belt Feed Mechanism (BFM) Team. This team cleaned, serviced and loaded BFMs with a belt of 25 rounds. The BFM workshop was on 3 deck which meant that loaded BFMs, which weighed about 25 pounds each, had to be hand carried up to the Flight Deck for installation. A number of Air Group armourers were seconded to the Ship’s Air Gunners’ Party to supplement the ammunition supply teams. These fellows prepared the munitions to the extent possible in the magazines or hangar and brought it to the Flight Deck where they finished off, such as fusing and fitting tails to the bombs and assembling rocket heads to motors. As soon as the first pre-dawn serial had been launched one half of each team went to breakfast and the other half began preparing the aircraft for the next serial. This was a fairly simple exercise because (contrary to armament regulations) all serviceable aircraft had their ammo tanks filled at all times even when they were in the hangar – so preparation of the second serial only required the usual pre-flight stuff and installation of the BFMs and the loading of the rockets. Because the rockets could not be loaded until the aircraft spotted and the wings spread this exercise was a case of all hands to the wheel – which meant everybody. With the exception of 1000lb bombs, all ammunition was manhandled onto aircraft so armourers of the day were generally required to have a fair degree of brawn as well as brains. The second serial had to be launched before the return of the first so time was short. But the real labour of the day began when each serial returned. The returning aircraft had to have all weapons rendered safe and unexpended ammunition removed, prior to pre-flight inspections and rearming ready for the next serial. Serviceable aircraft were re-spotted and the unserviceable ones struck down to the hangar. This was an incredibly dangerous period – not only did the armourers have to contend with ensuring loose panels were secure in high wind environment, but they also had to beware of the hazards associated with landing and taxiing aircraft in very confined spaces. An additional danger was the occasional runaway hung-up rocket. The only thing preventing a rocket from moving forward off the launcher was a 2mm copper shear wire, and every now and then the sudden deceleration of the trapped aircraft and the forward momentum of the rocket was enough to overcome the shear wire and allow the rocket to hurtle up the Flight Deck and plunge over the bows. 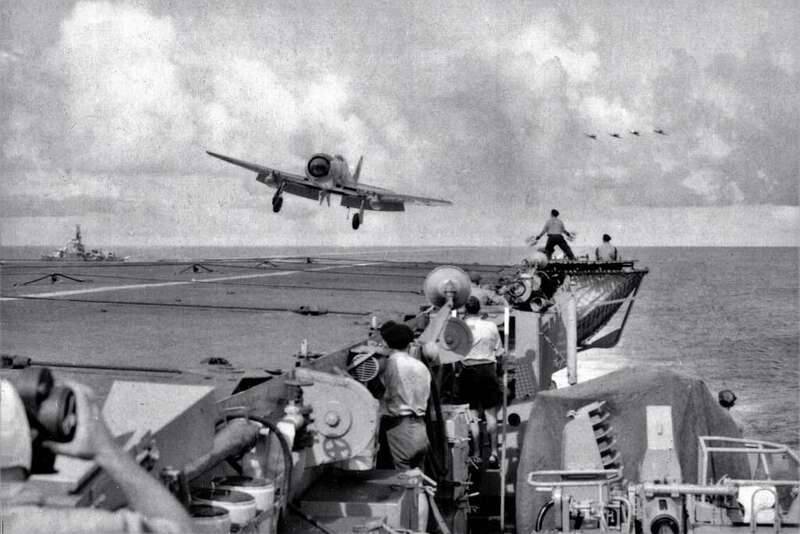 There was also the hazard of aircraft missing a wire and taking a barrier, or as was known to happen occasionally, to leap the barrier altogether into the forward deck park. Occupational Health and Safety regulations had not been invented then so safety was really a matter of everyone keeping an eye on what was going on and being very, very careful. In retrospect, it is surprising there were so few accidents or injuries amongst people working on deck. ‘SYDNEY was on a wartime complement, which meant that it was about one third greater than in peacetime, so it was crowded! The Air Group sailors were mostly messed in what on “Melbourne “ was 4 Charlie mess deck; it wasn’t called that on SYDNEY ( I cannot remember just what it was) but of course this mess deck had Buckley’s chance of accommodating everyone. For a start there were insufficient hammock slinging space, (yes, we all slept in ‘micks’) and there were not enough lockers. Most of the Air group sailors finished up sleeping in either the fore or after cafeterias and had lockers allocated somewhere there as well. My locker was in the after café and I was fortunate to find a hammock space and locker in reasonably close proximity, as well there was a hammock bin nearby. It was my great fortune that when the Air Group embarked the weather was very hot and a great number of sailors were sleeping on the fo’castle so spaces below decks were more abundant than usual. The unwritten rule on the mess decks was that once a space was taken it was yours unless it was left vacant for a considerable time, so to claim a spot in the heat meant you had a home later once the conditions took a turn for the worse – and Korea was for the worse. ‘Micks’ were not supposed to be slung until after 1800 and they had to be stowed by 0700, but even these conditions there were always hammocks to be negotiated around during supper and breakfast times and it was somewhat discerning to have someone snoring above your head while eating your Weeties or have some late riser land on the table among the diners. Space above the tables was air space and air space meant hammock space. On Monday 15 October the ship limped back into Sasebo, arriving at 1230. Damage from the storm was made good as far as possible. Another Firefly was supplied by UNICORN to take the place of the one lost at sea, but the four badly damaged aircraft could not be immediately replaced. SYDNEY sailed from Sasebo at 0800 on Wednesday 17th October for her second Patrol and made way towards her AO on the west coast of Korea, where Captain Harries assumed command of Task Element 95.11. During transit immersion suits were issued to aircrew – a sign of the approaching winter. Despite the lack of acknowledgement from the Pope, flying operations commenced early the next morning, 40 miles south of Point Oboe. Once again the Fireflies concentrated mainly on rail bridges and tunnels, with their success rate higher since the introduction of the modified low-level attacks rather than the earlier dive bombing technique. They had found the only way to put a bridge into a river was a direct hit, and the best way to achieve that was to descend to 100 feet in a 20° dive to drop bombs with delayed action fuses. To begin with, attacks were typically in flights of four aircraft so the ‘Tail End Charlie’ had to be clear before the leader’s bombs detonated 37 seconds after dropping. Later on, accuracy improved to the point where only one aircraft was required. Sea Furies focused on Coastal Shipping strikes and ‘Leopard’ targets consisting mostly of troop concentrations. The principal weapons were the 3” rockets and 20mm cannon. Rockets were typically released in a 15 or 30° dive and released from about 1,200 yards. The Hispano cannon with a mixture of HE, Ball and Incendiary was used against any soft-skinned target and was highly effective. October 23rd was dominated mainly by the Air Group’s participation in rescue attempts for a ditched American B29. Sea Furies provided top cover for ‘Dumbo Charlie’ which recovered four airmen from the water, and then did an extensive search of the area. Although much equipment was seen floating on the surface no more survivors were located. A little while later a further CAP was dispatched to another location where two groups of four airmen were reported in the water. Rough water thwarted rescue attempts, however, until a single survivor was spotted and a Firefly successfully dropped a G-Dropper close to the fortunate American, who was reportedly then recovered by HMAS MURCHISON. Altogether 13 sorties were flown in support of SAR operations, reinforcing the view that the SAR organisation in Korea was excellent. On the same day Lt.Cdr. J. Appleby RN had his aircraft damaged by flak during a strafing run on a village at CT143293. The aircraft had been vectored onto the target by Mosquito ‘Conrad’, which had fired smoke rockets to mark a concentration of troops and supplies. The attack covered some 80% of the target but Appleby’s aircraft was struck in the wing by ‘accurate and intense anti-aircraft fire’, necessitating a precautionary landing at KIMPO. Both Wheatley and Appleby were re-embarked aboard SYDNEY later in the day by Firefly. The third loss on Friday 26th involved a Sea Fury engaged in the Han River area that was hit by flak and crash-landed on a mudbank on the South side of the river. The Sea Fury broke in half on impact but the pilot, S/Lt. N. Knappstein RAN, was unhurt and saw the opportunity to sell the wreckage to the villagers for (reportedly) 1,000 Won. He was then speedily recovered by a boat from HMS AMETHYST, together with any salvageable items from the wreckage. Friday 26th also saw one of the more dramatic events for the CAG, when one of the Fireflies attacking a tunnel 10 miles south of SARIWON was brought down by intensive light flak. The pilot, S/Lt. N.D. MacMillan RAN and his Observer P. Hancox landed in a frozen rice paddy about 3 miles west of the target where they set up a perimeter to defend themselves against approaching North Korean troops. Overhead assistance was provided by Sea Furies from Sydney and Meteor jet fighters from the RAF’s 77 Squadron, which together held the enemy at bay until Sydney’s helicopter arrived just on dusk, having flown more than 100 miles to test the limit of its endurance. CPO Babbit, the rescue pilot, was subsequently awarded the DSM and the US Navy Cross for his actions, making him the only person during the Korean conflict to receive medals of distinction from two different nations for the same event. The story of the rescue can be seen here. 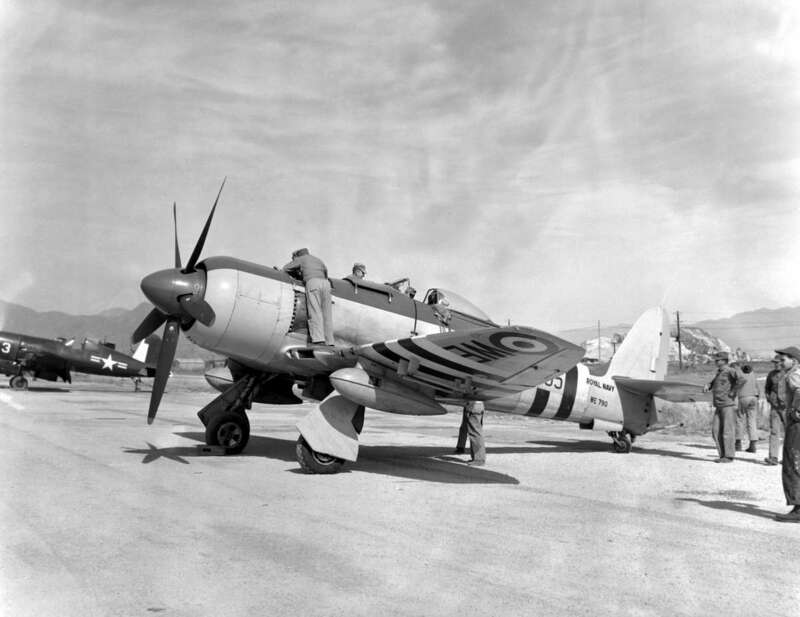 Allied aircraft in Korea were painted with the so called ‘Invasion Stripes’. These had first been introduced at the time of the Normandy landings and had proven to aid recognition and reduce ‘friendly fire’ incidents. Their use was discontinued soon after the landings, but it was reintroduced for Korea. The markings comprised five alternating black and white stripes, each of which was 18 inches (46 cm) wide, placed 6 inches (15 cm) inboard of the roundels on the wings and 18 inches (46 cm) forward of the leading edge of the tailplane on the fuselage. National markings and serial numbers were retained. The stripes were only used in the ‘shooting’ war in Korea: none were evident in the subsequent UN peacekeeping deployments. A total of 389 sorties were flown and the aircraft serviceability rate was reported as 84.5% for Sea Furies and 78% for Fireflies. SYDNEY remained in Kure from 27th October to 3rd November, during which a period of leave was granted to some of the Air Group for the first time since arriving in theatre. The USN arranged accommodation at Kyoto and Osaka for a few aviators, with the Osaka group playing golf for four days whilst the Kyoto group apparently fell in with a group of USMC pilots on R&R. The Squadron record hinted that they enjoyed themselves but was circumspect about what went on! All too soon, however, the ship headed north-east through the Bungo Suido channel, being joined by two Canadian ships which took part in an AA shoot whilst on passage. In a sign of approaching cold weather all aircrew were issued with Arctic clothing: string singlets, woolen underpants and socks. Flying commenced at dawn on Monday 5th November, with five Fireflies bombing a large bridge at WONTO and six Sea Furies attacking Troop Concentrations in the HAN RIVER area. A further three aircraft were involved in CAP/ASP duties. ‘52 Flight were first airborne and once more the Han River was the target. Troop concentrations were rocketed and strafed followed by an Armed Recce heading north from Packichan. it was during this recce that 52 leader was hit while making a strafing run on a possible truck at BT.670155. The aircraft rolled over on its back and dived into the ground, breaking into many pieces. No sign of life or of fluorescent panels were seen. One aircraft returned to the ship and the remaining two carried out Rescap over the area. Few enemy troops were seen and were strafed and some rockets put into a slit trench. Both aircraft were hit and soon had to land at Kimpo, being short on fuel. ‘The standard of air operations during this period has remained at a satisfactory level and the patrol was particularly noteworthy for the improvement in the standard of bombing by No 817 Squadron of Fireflies. I am pleased to be able to say that on 13th November no railway line was serviceable in the area covered by my aircraft, each having at least one bridge down or one line cut. The standard of deck landings has continued to improve; there has been but one accident in the last 427 landings and this was due to a momentary lack of concentration on the part of those responsible, allowing an aircraft to land without a hook. Handing of aircraft on deck remains excellent and the average time interval in catapulting is down to 42 seconds, although as low as 39 seconds has been achieved which reflects very favourably on the hard work of the Flight Deck Engineer Officer and the Flight Deck Officer and their teams. The percentage of aircraft hit by flak shows a considerable drop as the aircrew gain experience. This patrol is the last one on which Major G.H. Hardcastle serves with me as C.B.A.L.O and I wish to commend the excellent work that he, Major Simkin and the C.B.A.L.S. have been doing since long before the ship came to Korea. That my aircrew have been complimented several times on the performance of their duties is map reading and air spotting, is vary largely due to the excellent training they have received from the C.B.A.L.Os. SYDNEY sailed from Sasebo at 1600 on Sunday 18th November in company with HMS BELFAST, wearing the flag of CTG 95.8 and was detached the next day as CTE 95.82. This patrol differed somewhat as she started off the East Coast of Korea for two days before resuming her usual west coast operation. The primary purpose of the initial exercise was to destroy defences and communications of the port of HUNGNAM, during exercise ‘ATHENAEUM’, which was conducted in calm seas and good flying weather. An aerial shot of bridge between Haeju and Yonan on 27 Nov 1951. (817 Sqn Record). Over the next two days the Fireflies were heavily engaged in gunnery spotting, including for a Dutch Destroyer which amused the spotters with her radio terminology: (‘On Ze Way….Splish!’) The accuracy naval gunfire was directly proportional to the size of the guns: 3-inch frigates were woeful, and destroyers with 4-inch weapons not much better. Capital ships were a different matter, however, with the first ranging shot on target nine times out of ten. A broadside would then follow, which demolished the average target in a trice. On 22nd November SYDNEY moved to the West coast, but bad weather curtailed flying until the forenoon of the 24th. Even then it was difficult, with Fireflies climbing through cloud to drop their bombs from 13,000 feet – a quite different technique to the normal low level strikes they were accustomed to. Despite deteriorating weather further strikes by both Sea Furies and Fireflies were carried out over the next few days, but full flying days were a rarity as winter started to make its presence known. Above: A map of the region, showing the relative positions of Korea and the towns of Kure and Sasebo in Japan, where Sydney would dock in between patrols. Right: A copy of an 817 Squadron map of the time, showing the main (west coast) operating area. Of note is ‘Point Oboe’ on the bottom LHS where the carrier typically remained; and ‘Bromide Baker’ near the island of Paengnyoung-do, to the west of the primary areas of air operation for Sydney’s Air Group. ‘Armed Recce No 2 for the day was 51 Flight and this turned out to be a milk run. After checking some junks at 951904 a strafing attack was made on some troops in trenches. The flight then headed for [untelligible] to check the rail yard [for] box cars. On leaving this area 51-4 (Sub/Lieut Sinclair) was hit by an explosive shell and called up to say there was a smell of burning in the cockpit. He then gained height and headed seaward. Directly over the coast flame appeared from forward and underneath the aircraft and very shortly afterwards the aircraft went into an apparently uncontrolled dive. Approx 300-400 feet from the deck the pilot was seen to bale out and the parachute open at 100 ft. On hitting the ground the pilot was not seen to move, and when the helicopter from Bromide-Baker picked the body off the mud bank there was no sign of life. Medical examination subsequently showed that he was hit by the tail surfaces and the parachute was broken open by the impact. S/Lt Sinclair was one of the best shots in the Squadron and had the keenest eyesight of all, he will [be] missed by all – especially by those in the casbah. Sinclair’s body was recovered by helicopter and on completion of flying operations a service was held on the after end of the flight deck. In falling snow and with a grey and sombre background, his body was committed to the deep at 1745 local time at position 37° 35’N 124° 30′ E.
Four other aircraft were hit on the 7th December, with one Sea Fury piloted by S/Lt. Smith RN being forced to land on the island of Paeng-Yong off North Korea with its wheels up. He was rescued by helicopter. The remainder returned safely on board and, although not seriously damaged, required a good deal of work to make them serviceable again. The weather, which had been good until then, deteriorated considerably on Thursday December 13 but a full day’s flying was still achieved. It proved to be an expensive day as two more Sea Furies were shot down. Lt. Cooper was hit by flak during the Milk Run and as he was losing oil pressure and could not maintain height, elected to bail out at 800 feet north-west of Chinnampo. The remainder of his Flight acted as RESCAP as he was seen to walk along a creek bed displaying his yellow panel. He was picked up at 1055 by PEDRO FOX from Bromide Baker, which was fortuitous as SYDNEY’s helicopter had been damaged in a deck handling accident that morning. In the meantime the Furies strafed enemy troops who were seen to be approaching the crashed aircraft further up the creek. Later that day Lt.Cdr W.G. ‘Jimmy’ Bowles, the Commanding Officer of 805 Squadron, was flying at low level along to the coastline to Sydney when he spotted a large cave in the cliff face lit up and with some machinery in it. He circled to have a look but could not then see the cave as the North Koreans had dropped a camouflaged net over it. Making a third approach his aircraft was struck in the oil cooler by small arms fire, so he bailed out to land in shallow water. He was picked up by a friendly junk and taken to a nearby island, where he too was recovered by PEDRO FOX. The oil system was a known vulnerability of the Sea Fury, which was otherwise a rugged aircraft well able to take punishment. Both Bowles and Cooper were subsequently transferred to TOBRUK, where they enjoyed an extended stay due to high winds and frequent snow storms preventing their transfer back to SYDNEY until midday on the following Monday, the 17th December. By then the ship had detached from the AO and was steaming towards Japan, having completed her fifth operational Patrol. Larry Adler’s concert aboard HMAS Sydney in December 1951. The Sea Fury in the background carries RN markings under the wings, so it was a replacement aircraft supplied by UNICORN (FAAM image). On 19 December SYDNEY arrived in Kure at 1100, a particularly welcome event as it was to spend Christmas there. One hundred and thirty bags of mail awaited her, including three parcels for each of the ship’s company: one from the RSL and one each from two of the major Australian newspapers. A concert was also held on the flight deck, featuring the renowned harmonica player Larry Adler, a welcome relief from the grinding toil of the past weeks and a wonderful way to take minds off the sacrifices of recent times, if only for a short while. Flying operations for the sixth Patrol began at 0750 on the 29th December, with SYDNEY’s command noting (from the reports of its aircrew), that ‘…there was not a great deal of alteration in the general situation’. A full day’s flying was achieved, but the next day she was unexpectedly required to steam south to provide a CAP for two convoys heading south out of INCHON. The third and final fatality of the deployment occurred on 02 January 1952 when Sub Lieutenant Ronald Coleman became separated from his leader during a CAP over the Yellow sea and was never seen again. An immediate and extensive was initiated in poor visibility and low cloud, but nothing was found except a patch of oil on the surface which may or may not have been from an aircraft hitting the sea. After many fruitless hours the search was called off and he was posted as missing, presumed dead. An event of note occurred on the 5th of January when Rear Admiral A.K. Scott-Moncrieff transferred from BELFAST during the forenoon. Whilst aboard he took the opportunity to arrange strikes on two targets on the north bank of the HAN RIVER, in a zone that SYDNEY’s aircraft were not normally permitted to attack. The Flag Officer briefed the crews personally, and during the subsequent attack one pilot, Lt. P. Goldrick, was wounded in the arm by a .303 round but managed to return to the ship for a safe landing. He was lucky insofar the energy of the bullet had largely been expended in passing through the lead shot of a message bag on the starboard side of the cockpit. He was the only member of the CAG to be wounded in action but was then not so lucky – apparently one of the first Navy Office responses was to signal that his flying pay had been stopped. The last two days of the patrol were spoiled by bad weather. SYDNEY cancelled the second launch on the 6th and only just in time as the ship was overtaken by an approaching front bring low cloud and snow showers for the remainder of the day and the following. It is of interest to note that the Type 960 radar excelled itself on that day by detecting a single aircraft at a range of 190 miles over the far (east) coast of Korea at a height of 42,000 feet. On 7th January SYDNEY departed to the south for Kure, her sixth patrol complete. Only 362 sorties were flown but this equated to just over 50 per flying day, so the rate of effort was maintained when the weather allowed. SYDNEY’s final patrol was significantly hampered by bad weather. The Korean winter was bitterly cold with temperatures well below zero, particularly in late winter when there were ice floes in the water. Navigation was far more difficult over terrain rendered featureless by a blanket of snow, and life for the Flight Deck crews was miserable (spare a thought for the chockmen, lying on a cold metal deck with their aircraft’s slipstream running over them). By January 1952 the bitter Korean winter had well and truly set in, as illustrated by the three photographs above. Life and work aboard Sydney, which was not the most comfortable of vessels at the best of times, became miserable. Aircraft systems froze, the catapult and arrestor systems had to be thawed before use and the ship was frequently covered in ice. Flight deck parties suffered the most, with the chill factor from the ship’s forward motion and aircraft slipstreams dropping the temperature many degrees below zero. It made things difficult for the aircrew, too – even when aircraft could be launched they found difficulty in map reading over a largely featureless terrain. (FAAM – click any image to enlarge). Left: Looking more like Antarctic Explorers than a maintenance crew, a group of Armourers wear whatever clothing they can to stay warm. They suffered the brunt of the cold weather as most of their work, together with the Aircraft Handlers, was on the upper deck. Although the first flying day on 17th January dawned fine and both Sea Furies and Fireflies conducted attacks, the conditions then deteriorated to the extent that the last event of the day was cancelled – and just in time, as the ship was once again overtaken by heavy snow which lasted until dusk. Operations continued on the 18th and 19th in borderline weather, with targets ashore being obscured by morning fog on the 20th. Things were not much better over the next two days either, with fog giving away to strong winds and rough seas. The Yellow Sea is relatively shallow so it doesn’t take long for a sea to develop. It was not until the 23rd that a full flying programme could be resumed, with attacks suspended for a while whilst the CAP and other aircraft joined in a fruitless search for a possible B29 wreck. A single drop tank was sighted but on investigation turned out to be from a Sabre. By the following day the temperature had dropped to about -10°C and the flight deck was treacherous, aircraft undercarriages were frozen and the arrester wires and barriers covered in ice. Nevertheless, two sorties were flown on that day and troop concentrations, mobile cranes and locomotives attacked. The weather then closed in even further, forcing SYDNEY to steam with revolutions for steerage way only, to ride out the Force 9 gale and rough seas as best she could. Even if the weather had not closed in, Harries’ thoughts may have been optimistic – there was a great deal of superstition amongst the aircrew regarding the survival rate of the last sorties of a tour and their cancellation was therefore greeted with some relief. Even though SYDNEY’s wartime exploits were finished, the trip home was eventful. She sailed from SASEBO at 1000 on Sunday 27 January, encountering fog off the coast of China necessitating a reduction in speed; but this did not delay the planned rendezvous with her old friend HMS GLORY about thirty miles south of Hong Kong. Six Fireflies Mk Vs that had been loaned by the RN were flown onto the British carrier, with both ships then berthing in the harbour where aviation stores and Korean Operational Orders were transferred between them. UNICORN arrived on 2 Feb and the remainder of the loaned aircraft and stores required on station were transferred to that ship. SYDNEY sailed for Singapore at 1145 on Saturday 9th February with a cargo of RAF Spitfires and Vampire jets, which presented their own problems: the Spitfires lacked folding wings and did not fit on the flight deck lifts. The Vampires would have fitted had the ship been equipped with a side tracking trolley, which she was not. Both aircraft types were therefore carried on the Flight Deck, with SYDNEY’s remaining aircraft struck below. (Of interest, this was the first and last time she carried jets – a series of budget cuts by the Liberal-Country party government effectively sounded the death knell for a two-carrier force in the RAN. SYDNEY never received the modernisation she needed to operate jet aircraft and after a brief return to Korea in 1953 for peace-keeping duties, she was relegated to a training role in 1955. She never carried fixed-wing aircraft in an operational capacity again). After transiting the Bight and rounding Cape Howe into the Tasman all serviceable aircraft – comprising 17 Sea Furies and 4 Fireflies were launched south of Jervis Bay and flown to NAS Nowra on Monday 3rd April 1952. SYDNEY and TOBRUK, who had been her companion throughout the Korean deployment, then entered the Bay that afternoon to be greeted by a flypast of 805 and 817 Squadron aircraft led by Commander J. Stenning RN. It was a fitting tribute to the ship prior to her arrival at Sydney on the following Wednesday, exactly 218 days after she had left for her wartime deployment. Korea was the first time the RAN Fleet Air Arm was engaged in a ‘shooting’ war. For HMAS SYDNEY it was almost exclusively an air war with the carrier operating, for the most part, some 40 miles off the coast with little to be seen of the land except on radar. The ship performed almost faultlessly and the conflict proved the skill and professionalism of a relatively young FAA: 2,366 sorties flown over 64 days in the operational area, for the loss of three lives and fourteen aircraft (including those written off by Typhoon Ruth). Operations were often undertaken in appalling conditions, but with a consistently high rate of success against a determined foe. It was said that enemy war effort was significantly curtailed on the west coast of North Korea and that this was attributed to SYDNEY’s Air Group. Having said that, there is a view that striking ‘tactical’ targets was disproportionate to the effort and expense applied: that is, a light fleet carrier deploying modern fighter/bomber aircraft against junks, ox-carts and pockets of troops may not have been the best way to advance the war effort. This author has seen little debate on this subject during his research and, in any case, seventy years on it probably doesn’t matter. What was done was done, and within the constraints of resources and time it was done well. The CAG’s performance must have been of particular satisfaction to SYDNEY’s Executive Officer, Cdr. V.A.T. Smith, who only a few years earlier had been instrumental in the planning and execution of forming the new Air Arm – an exercise fraught by the politics of the day. He went on to become known as ‘The Father of the Fleet Air Arm’ and achieved the very highest ranks in the Navy. You can read his story here. But more than the honour the ship and the Squadrons brought to the Navy, the Korean episode also proved again that the deployment of an aircraft carrier was a potent and highly cost effective way to project lethal air power to a distant shore. It is a lesson that sadly, has not withstood the test of time. The Naval Studies Group, associated with the University of NSW, has produced a video documentary of HMAS Sydney’s service during the Korean conflict. Featuring CDRE Norman Lee and Dr Fred Lane, both of whom flew there, it is a fascinating first hand account of the conflict. Click on the image above. If you enjoyed reading of the history of the RAN Fleet Air Arm in Korea, why not have a detailed look at the aircraft flown in the conflict? The Hawker Sea Fury and the Fairey Firefly heralded the era of modern, potent aircraft into the Fleet Air Arm, not long before they were tested in Korea. Simply click on either image to the left to read all about these amazing aircraft, with photo libraries, details of every airframe and anecdotes from those who flew and maintained them. RAN Website: History of HMAS Sydney III. RAN Website: History of 805 Squadron. Australian Aircraft Carriers 1929-1982 by Vince Fazio. This was in response to a request from the British First Sea Lord that HMAS Sydney relieve HMS Glory whilst she undertook much needed repairs. Glory was one of several Royal Navy light fleet carriers assigned to the Korean conflict. She proceeded to Australia for an extensive refit in Garden Island dockyard when Sydney relieved her. Local times for whatever part of the world the ship was in are used throughout this document, unless otherwise noted. 805 Squadron record for Tuesday 11 September 1951. The RAN’s FR.5 Fireflies were being progressively converted to AS.6 standard over the period of the first Korean deployment. This work had been completed by the second Sydney deployment. The RN’s 816 Squadron aircraft, FR.5 models, were strike aircraft equipped with 20mm cannon. AS.6 aircraft were for anti-submarine duties, with increased electronic detection equipment and power-folding wings – but no cannon. Dragonfly UP-28. Lt O’Mara USN was noted as being the helicopter pilot, but both crews and aircraft were changed during the deployment. It has been difficult to track the rotary-wing element as it was seldom mentioned, except when rescues were effected. Carrier Borne Air Liaison Officers. Typically of the rank of Major, these officers were responsible for seamlessly coordinating the delivery of Naval air power to meet the requirements of forces on the ground. 805 Squadron record for Thursday 27th September 1951. Because the ship’s radio aerials were always raised at night it was necessary to fit RADHAZ barriers at that time. Anti shipping strikes primarily targets small vessels, such as sampans and junks in local waterways or attempting attacks on nearby friendly islands. The NKA lacked any substantial vessels that would have presented a threat against Allied amphibious forces. The previous record up to that point was held by HMS Glory, with 84 sorties in a single day. Regrettably, HMAS Sydney’s ROP for the first patrol (including Typhoon Ruth) cannot be found. The details of the aircraft damage has been extracted from Squadron records for the period, which make further note that whilst the Sea Furies’ undercarriages withstood deck movement, those of some Fireflies were unable to do so and three collapsed. The Skimmer was an 18 ft long carvel built power craft which could carry about six passengers. The particular wave that washed this vessel overboard was estimated to be 45 feet high. Slipstream October 1995 page 33. ‘A Day In The Life Of An Armourer’. Jim Parsons, Slipstream Vol 19-1 March 2008. HMAS Sydney 20/2E/1 of 19 October 1951, paragraph 6. ‘Leopard’ was a shore-based controller who operated behind enemy lines. ‘Dumbo’ was the air callsign identifier for rescue Flying Boats. Helicopters were ‘Angels’, presumably because they rescued people. Sydney’s air callsign was ‘Shine’, a derivative of ‘Shoeshine’. 808 Squadron Diary October 25th 1951. According to the RAN’s History of 805 Squadron, Knappstein’s entrepreneurial flair netted about one shilling and nine pence. HMAS Sydney 20/2E/1 of 19 October 1951, paragraph 17. An A.25 is the lengthy form required in the event of an aircraft accident. 805 Squadron Diary entry for Monday 5th November 1951. Extract from ‘A Day In The Life Of An Armourer’. Jim Parsons, Slipstream Vol 19-1 March 2008. HMAS Sydney 20/2E/1 dated 01 December 1951 Paragraph 14. There is a view that S/Lt. Sinclair using the incorrect technique, whereby he trimmed forward, released the straps and kicked the stick forward. This would have brought the tail sharply up as he exited the aircraft. 805 Squadron Diary for Friday 7th December 1951. According to 817 Squadron’s Diary, the ship’s helicopter was broken when Lt Robertson was marshalled into it, damaging “the starboard mainplane” (perhaps a rotor blade?) and putting it permanently U/S. The Diary refers to the helicopter as ‘SHINE ANGEL’ (‘Shine’ being the radio codeword for HMAS Sydney and ‘Angel’ the codeword for a helicopter). Sydney’s ROP for that period makes note that a Destroyer was then lent to him each day from T.E. 95.12 to act as plane guard in place of the damaged helicopter. It would seem that Sydney’s chopper had been a useful asset for more than just rescuing downed aircrew. HMAS Sydney’s ROP reports that the two pilots were repatriated from TOBRUK on Sunday 18th, which differs from the account given in 805 Squadron’s diary. As the latter was endorsed by the signature of Bowles the author is inclined to believe this source. HMAS SYDNEY 020/2E/1 of 11 January 1952, paragraphs 6 – 7. ‘Reflections on The Royal Australian Navy’. Frame, Goldrick & Jones. Page 278. 817 Squadron record for the period 27th January to 7th March 1952. HMAS Sydney 22-3-1 of 27 March 1952, paragraph 8. Prior to 1947 aircraft carried on RAN ships were either RAAF or RN.